SUPER DUPER UPDATE: Nicole Vogelsong, Ryan’s wife, tweeted that her husband’s pinky finger is broken in two places. Once above the joint and once below. He will have surgery tomorrow and be out six weeks. She is also replacing Dave Groeschner as the Giants trainer on their next road trip. UPDATE: The Giants announced that Vogelsong’s right hand is fractured. This puts the Giants in a pretty rough situation. They will have to decide between organization guys like Yusmeiro Petit, Chris Heston, Boof Bonser or Mike Kickham. On the 25-man roster is Chad Gaudin, who has started 75 games in his 11 years in the big leagues. His lone full season as a starter came in 2007 when he started 34 games with Oakland, totaling a 4.42 ERA. In what had been his best start of the 2013 season, Ryan Vogelsong was injured during an at-bat in Monday’s game against the Nationals. On a poorly timed swing, a pitch from Craig Stammen appeared to deflect off of Vogey’s right hand. Bochy and trainer Dave Groeschner came out to take a look at the hand before immediately escorting the right-hander into the dugout. Vogelsong was pitching his best game of the season, cruising through five innings without allowing a run. He walked just one batter on top of three hits, stranding two runners each in the third and fifth innings. The Giants No. 5 starter entered the game with an ERA of 8.06, but lowered that almost a full run with his five shutout innings. 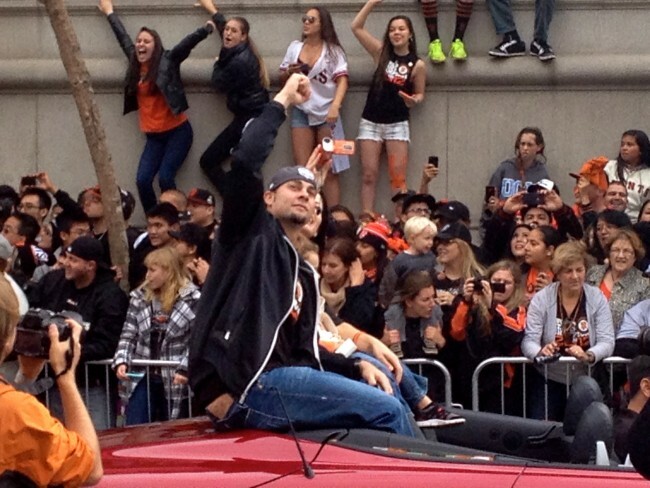 Vogelsong received a standing ovation from a sympathetic and intelligent crowd. No word yet on how the Peas reacted. Danny and I will be around for Bochy’s press conference after the game, where the injury will be the number one question for the skipper. Follow us on Twitter @GiantsPod and @HammerheadT for live updates.